With my New home lab in place it was time for me to proceed further with the Initial Setup and Configuration by spinning up some Virtual Machines. It took me 6 days to built my initial Home Lab setup not because it was quite big but because of my very busy schedule was packed with another VMware Education Training Delivery this week but I was able to manage some time out of my busy schedule and ended up with this initial setup. So what do we got ? Now when we have seen the hardware configuration let me inform you it is a High END Physical Desktop not a Physical Server yes It's definitely not a Physical Server and why is that? Well my pocket doesn't allow me to spend on a Physical Server and that to with a Basic Configuration when you can get a High End Desktop within the same Budget. For First Machine i used 172.20.x.x Static Ip address and the same 172.20.x.x as Default Gateway. Now Post this all the Windows Virtual Machine I created made them joined to the same domain HomeLab.Local to ensure there are not any Errors related to FQDN. However there is an extra step required for all other Non- Windows Machine in your DNS machine that you need to do add a proper entry in the Forward Look Up Zone and also you need to create a New Record in DNS. The only difference in the above link and current one is that i used ESXi 5.5 in my last lab however now i have used ESXi 6.0. As i mentioned ESXi installation is easy however the Configuration can be tricky sometimes but Thanks to DCUI which makes the configuration a lot more easy. All the four Virtual machines running with ESXi 6 I used the Static IPv4 addresses 172.20.x.x,172.20.x.x,172.20.x.x,172.20.x.x and also configured the DNS settings by specifying the DNS IP's address. It's Time to Provision vCenter Server for which i created another Windows Server 2008R2 Virtual Machine and used Windows Based Installation for vCenter Server6 running with an Embedded PSC and Embedded Database, with 2 vCpu and 8GB RAM. One of another Static IP addresses from 172.20.x.x range I used for vCenter Server and made this Windows Virtual Machine to be part of the same Domain HomeLab.Local. But this time when i had Beautiful Hardware Configuration which made me Fall In Love with her, I can't stop myself by not creating another Windows Based vCenter Server 6 running with the same configuration and joined to the same domain running in a Linked Mode. 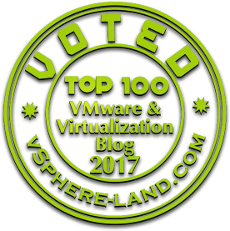 Well It's time to tell the Truth I Installed an Extra vCenter Server because of the Future Integration and Testing i planned about ! Yes that's right so lot more is coming up with my New Home Lab. When it come to creating a Virtual Machine for Shared Storage i prefer using OpenFiler again i refer it because the last time i Deployed my Home Lab i used the same here is the link for the configuration of openfiler Back to Basics - Home Lab Part 4. Don't forget to configure the settings related to DNS inside the Openfiler and also make sure we created a proper record in DNS to avoid any further configuration related errors. 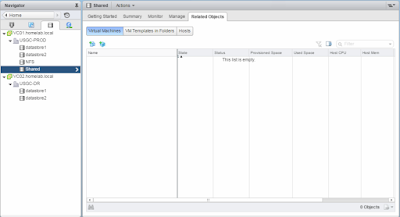 All my Shared storage requirements can be satisfied by Openfiler however i also have created NFS share running on one of my Windows Server 2008 R2 Virtual Machine and mounted it to my ESXi hosts. which i will be using as one of the shared repository for ISO Images. 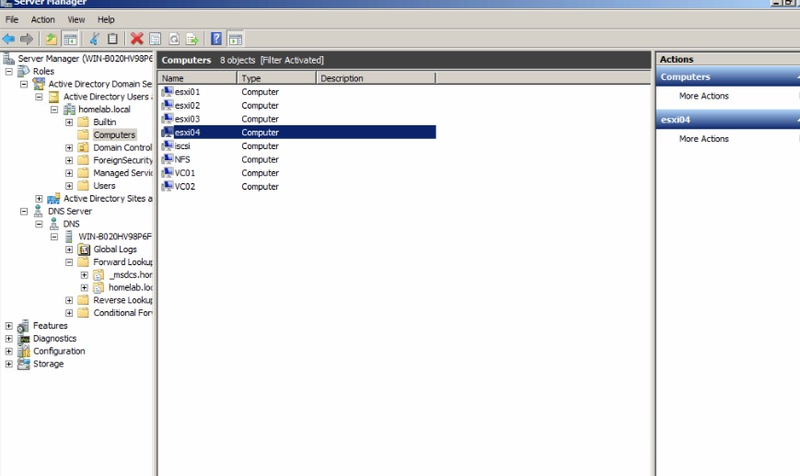 Datastore 1 and 2 are the local datastore for my ESXi's and Shared datastore is created using the LUN's created using openfiler. Hope this article help's you, do let me know if you are looking for some other functionalities /integration to be tested out you can reach me @kanishksethi on twitter. I am Really Excited to Test and Integrate more Features and Products with my Home Lab environment and will keep this space updated with all the latest findings.